For many travelers, a memorable food experience is of utmost importance when considering which destination to visit next. 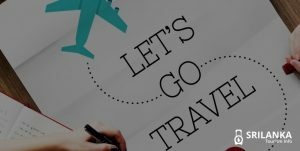 While adventure trips and laid-back holidays are something very normal, there are people who set out on the quest to enjoy the lip-smacking food offered by different regions. These are primarily food trips. If finding the best food experiences are on your bucket list, consider visiting Sri Lanka next. A cuisine rich in flavour and spice, Sri Lanka has plenty of mouth-watering options for every kind of food lover. While restaurants and cafes are in abundance in the country, the street food shouldn’t be given a miss. The real taste of Sri Lankan food can only be found on the streets and eats of Sri Lanka. In fact, there are some dishes that have originated in the food streets and have now made their way into fancy restaurants. Street food in Sri Lanka is full of surprises. Though you will find Indian influences in the spices and pickles served in the streets, Sri Lankan cuisine is a lot creamier and zestier. Coconut is an important element of Sri Lankan cooking. While coconut milk is used in curries, dedicated coconut is widely used in pickles and sambols. Other spices that are commonly found in Sri Lankan dishes include chilli, cinnamon, cumin, curry leaves and cardamom. There is a plethora of street food vendors and road-side cafes in Sri Lanka. The best way to enjoy Sri Lankan cuisine is by getting a taste of all the authentic delicacies, right where they originated. We’re about to engulf you on a gastronomic tour through the eats and streets of Sri Lanka like none other. If you’re in Sri Lanka’s capital city, Colombo, there’s only one place to start and that’s Galle Face Green. The area is a cross between a park and a beach. The huge promenade is used for rallies and parties. That’s exactly where you can sample Sri Lanka’s rainbow of street food. Wander along Galle Face Green in the morning and you’ll find cooks juggling small woks over an open fire and cries of cooks yelling orders at each other. It’s a sight not to be missed as every cook is on a mission to dish out hoppers to hungry diners. String hoppers make an important part of Sri Lankan breakfast. It is also one of the most popular dishes in the country. These steamed rice noodles are served with coconut sambol, dhal and other sauces. Apart from string hoppers, another Sri Lankan favourite is a dish called hoppers. It is a bowl-shaped pancake made from a mixture of coconut milk and rice flour. Savoury hoppers generally include toppings of your choice including eggs, meat, cheese, fried onions and coconut sambol. On the same street, you will also find hoppers with sweet fillings like honey or coconut palm syrup. The street food vendors and road-side stalls in Sri Lanka are experts in preparing short eats and snacks. One must-try dish when in Sri Lanka is Kottu. For those wondering, Kottu is a mix and mash of leftover rotis, colourful veggies, meat, cheese and eggs garnished with raw onion and chilli. It is relished by the locals and tourists alike. The description might sound unpleasant, however, try it once and your taste buds will be left craving for more. Besides eating Kottu, watch it being prepared. It’s a sight to enjoy. Try getting a video too. The dish is usually available late in the evening to late nights. With all the ingredients thrown onto a flat sizzling grill, you’ll see the chef rubbing metal blades into a jumping action. 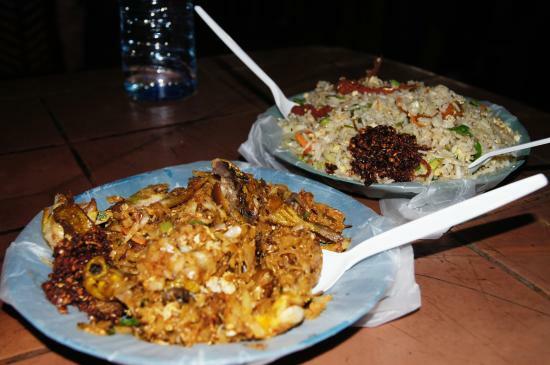 Though numerous restaurants serve Kottu, the dish is best eaten in hawker style. Nana’s on Galle Face Green is the best place to try Kottu. The original Nana’s opened here in the early 1980s. Though it no longer exists, the legacy lives on. 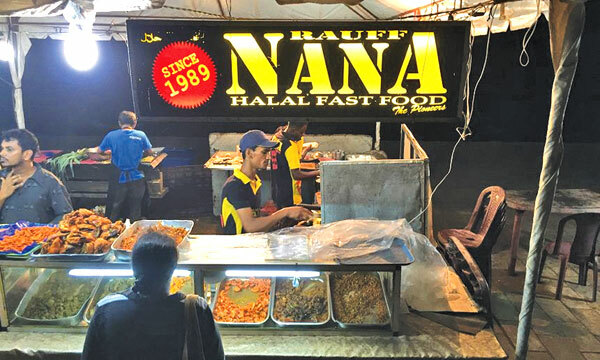 There are plenty of similar no-fuss restaurants that claim to be the original Nana’s – Nana Kings, Nana Rauf and Nana Toina. Most of these stalls overlook the iconic Galle Face Green Hotel. You’ll find numerous locals frequenting the place. Don’t expect something fancy in terms of presentation because in reality Kottu isn’t pretty. It is a messy pile of comfort food that is extremely tasty. Other specialities you must try at Nana’s include egg naan, devilled cuttlefish and crab. To quench your thirst you can order Sri Lanka’s popular beverage – Elephant Ginger Beer. Within this basic setting, tourists will definitely enjoy an eating experience next to nothing. Hotel de New Pilawoos is another street café where you can enjoy Sri Lankan delicacies at few pennies rather than pounds. While the stalls on Galle Face Green are open until 11pm, Pilawoos is open 24/7, satisfying the hunger pangs of locals usually post a club night or wedding party. Take a stroll around Pettah’s central station. You’ll find numerous vendors and food stalls selling short eats and Sri Lankan delicacies. Vegetables samosas are a staple. Though they are practically found all over the city, they’re most popular here. These triangle-shaped treats make a wonderful snack on the go. Chicken samosas are the most popular, but you’ll find beef and vegetable versions too. 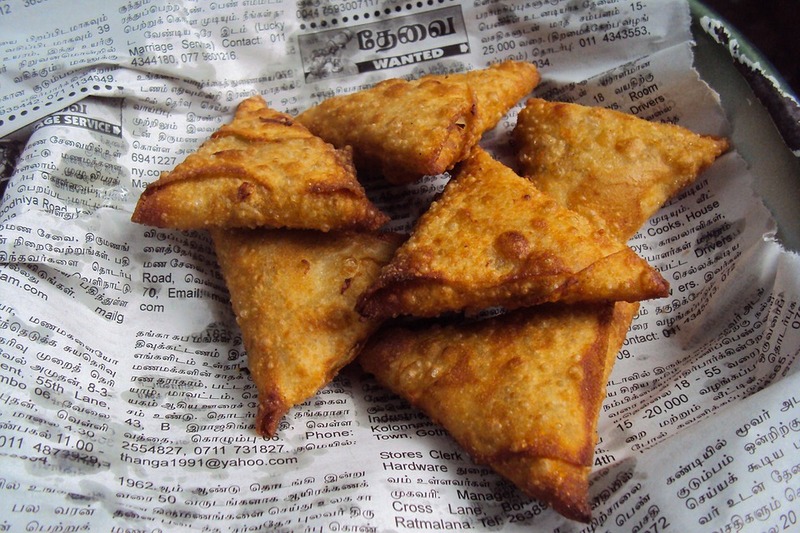 Besides the train station, you’ll also find some great samosas near Red Mosque in Pettah. Other dishes you can try at Pettah include achcharu, isso vade and Bombay sweets. Norris Hotel, which is a bakery and not a hotel, has a good variety of short eats. Pettah Market is also the hub of fresh fruits and vegetables. Woodapple is one such fruit that is native to the country. The exotic fruit is used to make juice. Though it appears as a coconut from the outside, once the fruit is cracked open, the flesh is to be had with a spoon. When in Pettah, don’t miss having it. You’ll find hundreds of vendors selling fresh woodapple in great quality. When in the tropical country, seafood can just not be given a miss. 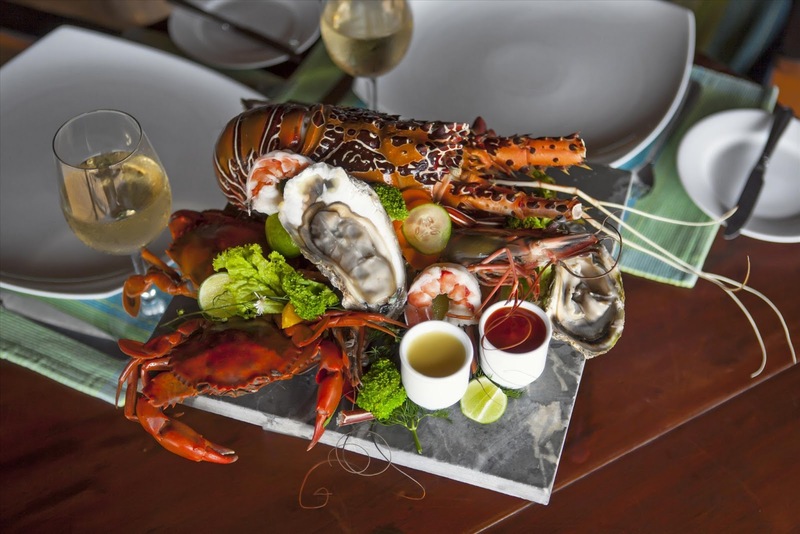 The best food experiences in Sri Lanka are all about fresh seafood. As the name suggests, the best place to grab yummy seafood is the beach. During the evenings in most of the coastal beach towns, you’ll find hundreds of hawkers setting shop to start catering to flocking crowds on the beaches. In Hikkaduwa, Unawatuna and Mirissa, you’ll find street hawkers setting up a few tables on the beach. Ditch Ministry of Crab and head to these eats and streets of Sri Lanka instead. We cannot guarantee the hygiene factor, but here you will find authentic seafood. From lobster to fish, crab and prawns, you’ll find it all. 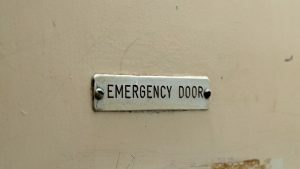 If at all you suffer from any allergy, be careful. Most of the meals on the beach are served with chips, fries and salad. A complete seafood meal can cost you $10 per person. Dining on the beach is always an experience second-to-none. The tropical breeze, sound of the ocean and a chilled beer or coconut water is all you need. Rice and curry is the national dish of Sri Lanka. You’ll find it on almost every menu. Sri Lankan Dahl bears strong similarities to the Indian counterpart. However, the one served here is richer in texture and spice. It usually consists of fresh coconut, spices and chillis. Upali’s is one such eatery in Sri Lanka where you must try their rice, curries and dahl. They serve authentic local cuisine boasting of scrumptious flavours. You cannot possibly miss the Pani Pol, also known as sweet coconut pancakes in Dehiwala. You’ll find numerous vendors on wheels that make this tasty dish with fresh coconut and sugar. Besides Dehiwala, Wellawatta area also serves some amazing Pani Pols. 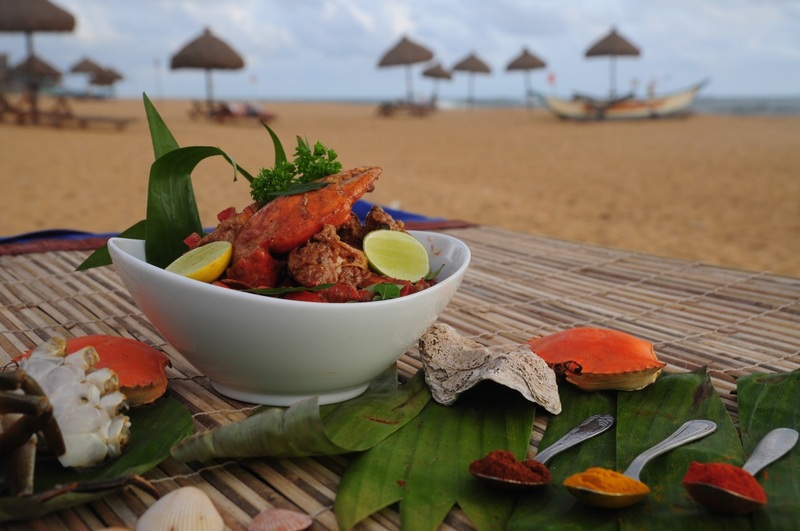 On the other hand, Mount Lavinia is famous for its seafood specialities. There are many seaside restaurants that served butterfish, snapper, squid, lobster, crab and king prawns. There are variety of seafood restaurant to choose from and beach food stalls that prepare the dish to your liking by combing sauces and spices. To find the best food experiences in Sri Lanka, eat like the locals do. Always remember, a great food experience doesn’t have to necessarily be expensive. In fact, the simple and affordable dining spots are the most memorable. Once you arrive in Sri Lanka, ask your hotel staff or tuk-tuk driver where they eat. You can even ask them to recommend the popular streets and eats of Sri Lanka. When you are on the quest looking for street food dining options, look where locals are dining, not tourists. These are the places where you’ll generally find affordable yet sumptuous food. Ask the waiter or steward what their signature dish is and order away. It’s always a good idea to look around and see what others are eating. The cleanliness, quality and hygiene of food streets in Sri Lanka cannot be guaranteed. Therefore, if you face any kind of allergic reaction, discontinue eating something that did not suit you. You can also read our blog on the 10 must dry dishes in Sri Lanka. 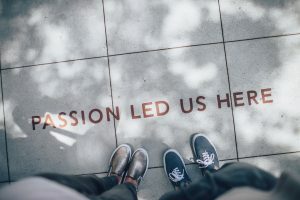 Have you relished street food in Sri Lanka in other places apart from the ones mentioned in this blog? We would love it if you could let our readers know in the comment section below.